The atmosphere in this little-visited part of the coast seems to be world away from the packed beaches of Varna, Golden Sands, Sunny Beach and Albena. Locked in rural solitude, it's an ideal place to get away from it all. 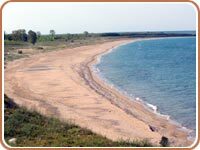 The village is surrounded by one of the largest and finest beaches (length>6 km.) on the Bulgarian seaside. The sand dunes and the beach are remarkably undeveloped, and the whole gem of place maintains its wilderness and authenticity. The Hellenes used to name the Black sea Pontus Euxinus, amiable sea. And it’s true that the Black sea near Krapets is amiable and hospitable: calm and pure, without ebb-tide, without dangerous fishes, with fine sandy bottom. 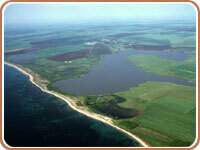 Just a kilometer northeast of Krapets is a fish-rich Dourankoulak lake. It attracts fishing fans with plenty of Pike-perch, Carp, Catfish, Bream, Crucian carp, Rudd, and even European eel. The lake, with semi-salty water and swamp flora, is surrounded by steppe vegetation. On the narrow strip separating it from the sea is the sand-dune hugging plant life. It is famous for being a reserve for a number of marsh birds, some of them are registered in the Red Book of the fauna species in Bulgaria. On the big island in the Durankulak lake is discovered the temple of Kibela - the oldest prehistoric necropolis in continental Europe. Nearby remains of the ancient Eneolithic settlement (existed from 5400 to 4100 B.C) were excavated. Excavation has also revealed many other finds dating back to various periods of human civilization. All archaeological finds can be seen in Historical Museum of Dobrich. Find more details and photos about this unique site here. Copyright © Krapets.com 2004 All Rights reserved.